Sony Corporation’s proposed 100% acquisition of EMI Music Publishing (EMP) is in process – but the major is facing more opposition in Europe than it would have hoped for. Last week, IMPALA once again announced its official opposition to the Mubadala consortium deal – which values EMI Music Publishing at $4.75 billion – just as European Commission regulators began their initial assessment of the acquisition. Now, the British Academy of Songwriters, Composers and Authors (BASCA) has announced its formal opposition to Sony’s EMI Music Publishing acquisition. It is calling for the Mubadala deal to be blocked in favor of EMI being run as a standalone business or ‘else combined with smaller music companies to guarantee a fair and competitive market for European talent’. BASCA – whose members include Sir Paul McCartney, Dizzee Rascal, Florence Welch, Sir Elton John, Chris Martin, The 1975, Kate Bush and more – says it believes the EMP buyout would result in a Sony ‘major-superpower’ which would ‘limit creator choice and could potentially undermine the future autonomy of creator rights’. 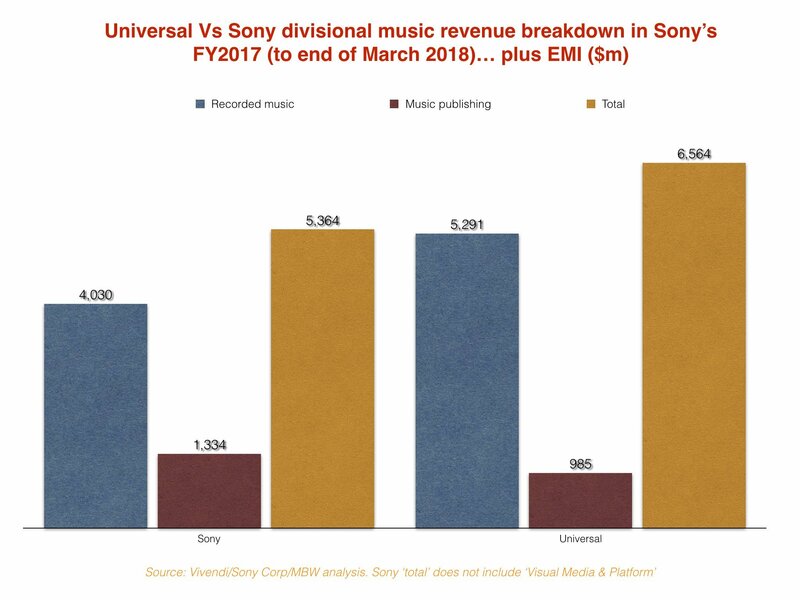 According to MBW’s analysis, Sony’s takeover of EMI wouldn’t quite create the world’s biggest music rights-holder – a title which would remain Universal’s – but it would result in the globe’s biggest music publisher being owned by the same parent as the world’s second biggest recorded music rights-holder. Sony Corp’s music publishing catalog currently stretches to 2.16m songs. If EMI Music Publishing was fully owned by the company, that number would grow to 4.21m. In 2012, Sony acquired approximately 30% of EMP as part of a consortium buyout from Citigroup (in the same deal, the Mubadala-led group acquired 60% of the company). Since then, Sony Corp-owned Sony/ATV has acted as the global administrator of EMI, and counts EMP’s quarterly/annual performance in its own industry-facing market share figures. BASCA claims that, should it be permitted to buy EMP, Sony Corp would forge a ‘capability to dominate licensing markets and – via direct online licensing deals – raise serious implications for the autonomy of collective rights management’. Crispin Hunt, songwriter and Chair of BASCA said, “At a time when the EU is looking to restore a balanced, diverse and competitive online marketplace for music, to allow the concentration of market leverage in this way seems antithetical to that purpose. As yet, there appears little evidence that the (unchallengeable dogma of the) market-share-music-model will successfully deliver the flourishing musical environment that consumers desire. EMI Music Publishing generated revenue of $663 million, adjusted operating income of $181 million*, and adjusted EBITDA of $249 million* for the fiscal year ended March 31, 2018. Commenting on behalf of the BASCA Songwriters Committee, Helienne Lindvall said, “Creators should expect that their copyrights will be known to the publisher and exploited fully. They should also expect their publishers to work closely with them on a personal level to develop their careers.